Each year, the Ceremony of Remembrance is held on the first Sunday of each May at Queen’s Park in Toronto. In 2016, the Ceremony will be on Sunday, May 7th, 2017. 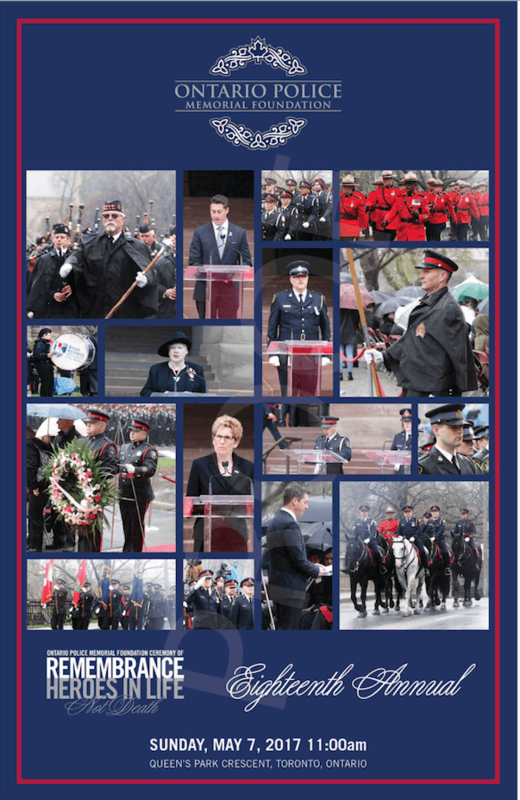 On Sunday May 7th 2017 at 11am, the 18th annual Ceremony of Remembrance for Ontario’s fallen police officers will take place at Queen’s Park, Toronto. All 264 names will be read aloud beginning at 10am, by two recruits representing the latest graduating class of Ontario’s finest from the Ontario Police College. Music from theWaterloo Regional Brass Band and songs from members of the Ontario Police Choruses will be performed prior to the arrival of the Procession of Honour. Attending the Ceremony will be the Honourable Elizabeth Dowdeswell, Lieutenant Governor of Ontario; the Honourable Kathleen Wynne, Premier of Ontario; the Honourable Dave Levac, Speaker of the Legislative Assembly of Ontario; the Honourable Marie-France Lalonde the Minister of Community Safety and Correctional Services of Ontario; and the families and friends of the fallen officers. The architectural illumination of the CN Tower will be done in blue light the evening of May 6th to May 7th to honour police officers in the Province of Ontario who have lost their lives in the line of duty. 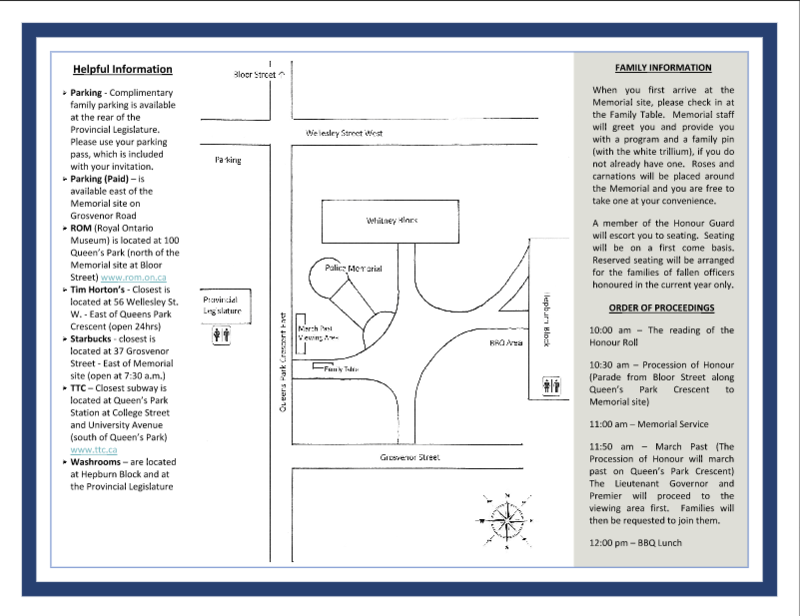 The Ontario Police Memorial Foundation will be streaming live on Youtube and/or Facebook and posting updates on Twitter and Instagram throughout the Ceremony.